Past posts have noted many points of divergence between the citation norms manifest in most judicial and lawyer writing and The Bluebook‘s dictates. They include such matters as case name abbreviations, the identification of a writer’s online source for cited primary authority, the format and content of treatise citations, and inclusion of a currency date in citations to statutes or regulations. The Bluebook‘s continued reign over law journal commentary and programs of instruction on professional writing in U.S. law schools has largely been taken for granted. Its dominance within the legal academy is undeniable. Ten years ago Professor Ilya Somin of George Mason explained that dominance in terms of market failure. He argued that it was primarily a result of the decision’s being made by short-termers, student board members at a time they no longer bear the cost of compliance and who, having previously mastered The Bluebook‘s arcane rules, derive some satisfaction from imposing them on their successors as a form of hazing. In a companion Bluebook critique Professor Somin noted that The University of Chicago Law Review had, without evident loss of quality or prestige, employed a simpler and more rational citation scheme ever since 1986. 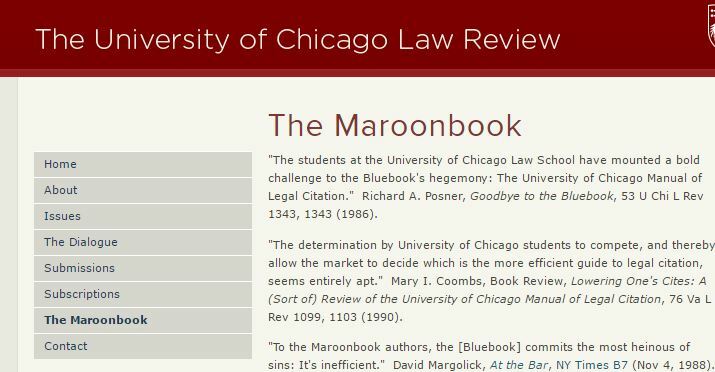 Today that journal still follows its own citation guide, the “Maroonbook.” The University of Chicago manual is not a rule-for-every-situation guide. It aims, instead, to establish a framework for citation, in which general principles of sufficiency, clarity, consistency, and simplicity operate. In length it runs to 85 pages compared to The Bluebook‘s 560. Will others likely follow? The process of article submission has moved online. Rarely, today, are articles prepared for and submitted to a single journal. Using services like Expresso and Scholastica most law faculty members submit their scholarly writing to multiple journals at once. The vast majority of those journals require citations of submitted manuscripts to be in Bluebook form. This adds a powerful network effect to the factors of market failure cited by Prof. Somin and the prestige and strength of The Bluebook brand. As sound a decision as The Berkeley Journal of Gender, Law & Justice has made, it seems unlikely to foreshadow a large scale exodus of journals through The Bluebook‘s force field.